This small gift box could also be a favor box and you can make it in many sizes. Put your gift or favor in the center of the tissue paper and place it in the box for a lovely presentation. You can use it for any holiday or occasion simply by changing the color of the decorative paper on it. Think of using it at Easter with a handle, or for Mother’s Day, a wedding, a baby or wedding shower, a tea party, Christmas, Thanksgiving, or Halloween. Just add candies and/or nuts or small favors. Or use it to present a gift. 1. Start with a square piece of cardboard or card stock. This box was made with cardboard like that on a pack of designer paper. This 9 inch square piece of cardboard makes a 3 inch square box. 2. Divide the square into thirds both horizontally and vertically, so there are 9 squares. Cut off all 4 corner squares. 3. Score across the bottom of each side piece, and top and bottom piece. 4. Cut 4 squares of colorful paper that are 1/4 inch smaller than the squares on the box. My box has squares that are 3 inches, so I cut the colored paper into 2 3/4 inch squares. 5. With double sided tape, attach a colored square to each of the outer squares, making sure that the bottom of the design is closest to the center square. Center the paper on the cardboard square. Burnish the paper to be sure the tape adheres. 6. Punch a hole in each of the top 2 corners on each outer square. 7. Cut 4 lengths of ribbon or twine about 10 inches long. 8. Fold each side on the score line, to the center and crease sharply. 9. Bring 2 adjacent corners together, thread ribbon or twine through the holes and tie into a bow. Repeat with the other 3 corners. 10. Cut 1 or 2 pieces of coordinating tissue paper into 10 inches by 12 inches (for the 3 inch square box). Place the gift or favor in the center of the tissue, gather the sides up around it, and place it in the small gift box. Adjust the corners and edges of the tissue paper as needed. For a larger size box, the tissue paper will also need to be larger. Always start with a square, and divide it into thirds to create this box. 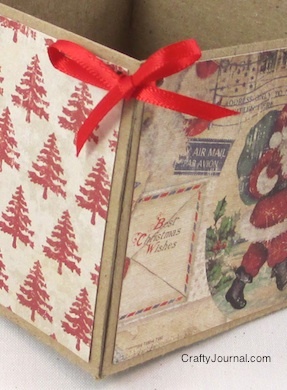 You could use Christmas cards or greeting cards cut to size instead of designer paper. such cute ideas, love it!! This is great! I love it and it seems very easy to make or adapt to your needs. No more looking for the right little box for favors. Thanks! A great way to reuse small pieces of Christmas paper and a great way to present gifts. A great way to reuse small pieces of Christmas paper and a great, reusable way to give presents. You’ve done it again! Simple but brilliant! I love how sweet these look. Such a great idea for packaging so many Christmas goodies. These boxes are adorable! Thanks for the tutorial! I love this! Your gift box turned out wonderfully, and I love how easily it can be customized for any occasion. Given the variety of printed papers that are available, the possibilities are nearly limitless! Thanks so much for coming by the party and sharing your project at Wake Up Wednesday! Thanks for sharing such a fabulous gifting idea, I will try this. I found this post through ‘Whatever Goes Wednesday’ linky. I was intrigued by the idea and drawn in by that beautiful, crisp photo! I used to do this….but I had forgotten how cute they are. Thanks for sharing. So simple and elegant! I was thinking you could even use fabric scraps from the “stash”. Wouldn’t woolen plaid be fun? What a great idea with Christmas coming up. Thank you for sharing at The Southern Special. Such a wonderful idea,loved it !!! Fun, easy and adorable. Thanks for sharing this at Wake Up Wednesday Linky Party. Very cute – looks easy to make too. Oh this is too clever! I love it. It would be perfect for those small little gifts! love this – it would be so easy to personalize for storage or to make one for particular holidays or birthdays! great idea and appreciate your sharing it with us at our Creative Craft Challenge Noreen!! Super cute, and easy idea!